You will receive a PASMA certificate for a completing a short mobile towers training course, ideal for those working from lightweight access towers. 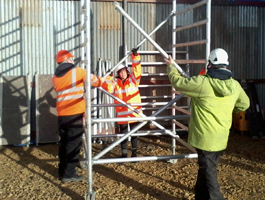 This course is suitable for all personnel who work from lightweight access towers. To enable maintenance and inspection staff to safely erect, use and inspect lightweight access towers. You will be tested with a theory and practical test. You will receive PASMA certification of training that is valid for five years.